Nice simulation, that is very convincing. I was tempted to say that settles it, historically stock markets return more that cash in the bank, but I guess we already knew that :). With unlimited leverage I expect if you set the target return higher that historical stock market average returns, Value Averaging would always beat Dollar Cost Averaging. But of course there would be the practical matter of the margin calls you would face in years like 1987 and 2008. @Greg: If I had data for historical margin interest rates, I could simulate the case where you borrow, but it wouldn't add anything for investors who wouldn't borrow to fund a leveraged all-stock portfolio. You can do variants of DCA with leverage as well, so I don't think it's certain that VA would win in this case. I'm unlikely to investigate further because I'm not interested in blowing up my future using leverage. The DCA reviews I've seen have been for a single asset class (lide the S&P 500). I wonder if expectations may be improved when it's applied to a diversified portfolio (eg, of index funds). In a hand-waving way, it sort of seems intuitive that the dollars would go to the best purchases among the asset classes with each periodic portfolio investment. But I don't have the mathematical acumen to decide whether this actually might happen (or the time/data to run scenarios empirically, tho I might try this in the distant future--which will be too late, as I have a cash lump sum that I'm nervous about putting into the current high equity markets all right now). Any comments, or have any readers seen studies of DCA on diversified portfolios? @Anonymous: DCA means different things in different contexts. In this article, I used it to mean investing $1000 each month because that is how the money becomes available through saving from income. When you're talking about doing DCA with a lump sum, the situation is very different. If you hold back some cash on the sidelines, you incur an opportunity cost. 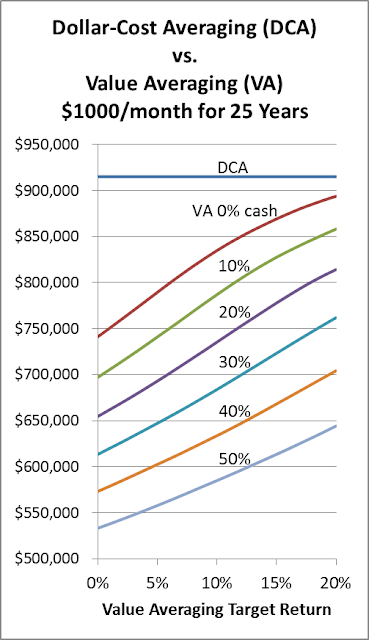 Essentially, investing the whole lump sum has a higher expected return than using DCA, but DCA is less volatile. I don't think it matters whether your portfolio is all stocks or balanced. Hi Michael,did not mean to challenge, so much as I was frustrated. There are a huge amount of web sites both for and against Value averaging, that will reference some study by a college professor or student. The studies, like Simon Hayley’s paper, almost always end up using calculus. Unfortunately my high school did not offer calculus. So I can not verify their work. On Robert Shiller’s web site did you use ie_data.xls, and in the spreadsheet which column did you use for your share prices? In this situation, if you analyze value averaging by assuming a particular return distribution such as lognormal, calculus is unavoidable. I find that people are much more impressed with experiments using actual historical returns, so that's what I used here. A side benefit is that you need less math. I did use ie_data.xls from Shiller's site. I used the "Real Price" column, but that excludes dividends. So, I used the "Real Dividend" column to create a real (inflation-adjusted) total S&P Comp. return. (Note that the dividends are annualized and have to be divided by 12 to get monthly numbers) For the short-term interest rates I used column "CPI" along with file chap26.xls column "One-Year Interest Rate". This might be overstating the interest rate on cash somewhat. Thanks for taking some time dedicated to this topic (VA). I recently starting to research about it. - They are from different sources. - They disclosure simulations, assumptions and formulas applied. - Most targeted the indexes (index investments) but there are many covering all asset classes and subclasses (EM,Bonds,SmallCaps,Commodities,RealState,specific stocks,etc). - One of them focus on analysis of risk behind each method. - They all them concluded that VA is superior for long term investments. Definitely VA is more complex than DCA, LS and PR. But the conclusions seems to be so strong that I wonder what we are missing. Thanks again for your blog which is a great space for all us, small investors looking to do it better. If your have time, please, let us know what you think. 1. VA dictates to investors how much they will invest at each point in time instead of just using the funds an investor actually has available. 2. Closely-related to the first point, many VA analyses ignore borrowing cost and the opportunity cost of leaving cash on the sidelines. 3. VA strategies often end up investing a higher proportion of a portfolio in stocks than was used for a DCA portfolio thereby demonstrating that stocks tend to beat bonds rather than saying anything about VA vs. DCA. 4. Some VA analyses use future information to choose the perfect return target for a given time period. Obviously, if someone knows precisely what the average market return will be for the next 20 years, that person could devise a strategy that would beat buy-and-hold. If I were to go through all the research papers you pointed to, I would be looking for these failings or any new failings. If you could point me to one of the papers that seems to be free of these problems, I could take a look. I have read your article but I am confused as to how you did your actual analysis because all you show is a graph, rather than providing detailed reports or a dataset snapshot of your analysis. 1. You can easily get around this problem by simply creating a reserve or 3 months cash. For example if you wanted to invest $1,000 per month create a reserve of $3,000. Then each month add you $1,000 to your reserve and then make your VA investment. On some months you would invest less then $1,000 and some months more. If you have exhausted the reserve then you would just invest the $1,000. At some point the reserve will have cash again because you will have some sell transactions. 3. VA works best with stocks especially if they tend to be more volatile. It does not work well with bond funds or bond ETFs. 4. People tend to get hung up on what return to use but it is fairly simple. Use the long term historical average for the asset class you are investing in. If you are investing in small caps use 12%, growth stocks 8% etc. If you are wrong about the rate of return you chose all that would happen is that if the rate was too low you end up with more cash and if it was to high then no cash in you side account. You can re-adjust the rate after 1 year to improve the returns. VA does not always beat DCA or lump sum but in the majority of cases is does, based on my testing of the method. @Anonymous: The extensive simulations I performed tried several levels of cash on the sidelines. I found that the opportunity cost was high. My simulations were based on stock returns. My testing of VA indicates that it usually loses to DCA.